The ability to stay calm under pressure is a massive predictor of performance. In this article, originally published on LinkedIn Pulse, Dr. Travis Bradberry provides five strategies that you can start using today. There are two kinds of people in this world: those who believe they can make things happen and those who believe things happen to them. The first group is convinced the outcome of their lives and careers is more or less in their own hands, and they wouldn’t have it any other way. The second group takes more of a Forrest Gump approach: They sit around and wait for the bus to take them somewhere. University of Florida psychologist Tim Judge and his colleagues have shown overwhelmingly that people who feel they control the events in their lives (more than the events control them) and are confident in their abilities end up doing better on nearly every important measure of work performance. Of course, when good times are rolling, nearly all of us believe we have the world by the tail. What makes the Empowered in Tim Judge’s studies special—whether they work on the shop floor or in the C-suite—is that they don’t get overwhelmed when the going gets tough. Just like you, the Empowered feel intense stress and anxiety when hard times strike, but they use this anxiety differently. Since the Empowered believe they have control over the outcomes of their lives, their anxiety fuels passion instead of pity, drive in lieu of despair and tenacity over trepidation. Whether the Empowered find themselves presiding over a division with tanking revenues, on the receiving end of a scathing performance review or staring yet another job-hunt rejection in the face, they refuse to wave the white flag. They redouble their efforts. The Empowered outperform everyone else because the ability to manage your emotions and remain calm under pressure has a direct link to your performance. TalentSmart has conducted research with more than a million people and found that 90 percent of top performers are skilled at managing their emotions in times of stress in order to remain calm and in control. Anxiety is an absolutely necessary emotion. Our brains are hardwired such that it’s difficult to take action until we feel some level of anxiety (also called stress). 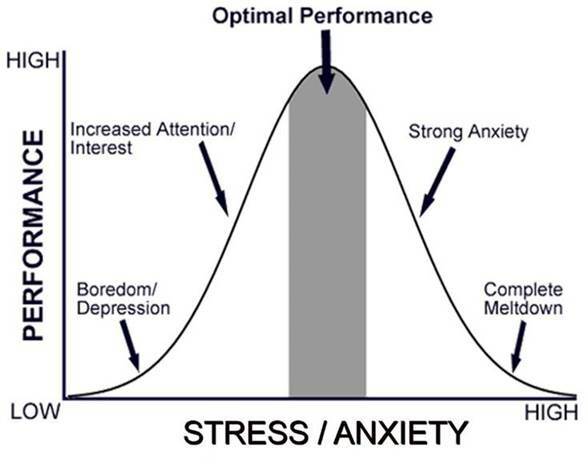 In fact, performance peaks under the heightened activation that comes with moderate levels of anxiety. The trick is to manage your stress or anxiety and keep it within optimal levels to achieve top performance. We all know living under stressful conditions has serious physical and emotional consequences. So why do we have so much trouble taking action to reduce our stress levels and improve our lives? Researchers at Yale have the answer. They found that intense stress actually reduces the volume of gray matter in the areas of the brain responsible for self-control. As you lose self-control, you lose your ability to cope with stress. It becomes harder for you to keep yourself out of stressful situations, and you’re more likely to create them for yourself (overreacting to people, for example). The Yale research shows us why so many people get sucked into progressive rounds of greater stress until they completely burn out. Dwindling self-control is particularly scary when you consider that stress affects physiological functions in the brain, contributing to chronic diseases, such as hypertension and diabetes. And stress doesn’t stop there—it’s linked to depression, obesity and decreased cognitive performance. If you don’t have the tools in place to keep your anxiety in check when it boils up, you’ll never realize your full potential. But you can get better at managing the anxiety you inevitably feel when facing difficult and uncertain situations. You just need to follow the steps that successful and empowered people take to keep their anxiety from taking over. The key thing to understand before getting started is that you are indeed facing uncertainty—the outcome of your future has not been decided. It’s up to you to develop the beliefs and mental toughness that will make you one of the Empowered. Step 1: Expect and prepare for change. People change and businesses go through ebbs and flows. It’s a fact that even the Empowered in Judge’s study can’t control. They’ve found themselves out of work. Their companies have fallen on tough times. The difference is they believe they are fully capable of dealing with changes and making something positive happen. In other words, they are mentally prepared for change—and you can be too. If you don’t anticipate change naturally, you need to set aside some time regularly—either every week or every other week—to create a list of important changes that you think could possibly happen. The purpose of this task is not to predict every change you’ll face. Rather, it will open your mind to change and sharpen your ability to spot and respond to impending changes. Even if the events on your lists never happen, the practice of anticipating and preparing for change will give you a greater sense of command over your future. Step 2: Focus on your freedoms, not your limitations. We’ve all had the old mantra life isn’t fair beaten into our brains since we were young. This mantra is a voice of despair, anxiety and passive inaction. Although it’s true we sometimes have limited ability to stop negative events from occurring, we are always free to choose our response. On your list of possible changes from Step 1, jot down all of the positive ways in which you can take action and respond to each change. You’ll surprise yourself with how much control you can wield in response to seemingly uncontrollable circumstances. Step 3: Rewrite your script. Step 3 is going to be the hardest because it requires you to change the mode of thinking that you’ve grown accustomed to. Over time, we all develop mental scripts that run through our heads and influence how we feel about our circumstances and what we do in response to them. These scripts go so far as to tell us what to say and how to act in different situations. In order to be empowered, you’ll need to rewrite your script. To do this, recall a tough time you recently went through. What was it you believed about your circumstances that prevented you from making the most of your situation or responding more effectively? Write this script down and label it your hard-luck script. Since hindsight is 20/20, go ahead and write a more effective and empowered mental script that you wish you had followed next to it. This is the empowered script you will use to replace your hard-luck script. File these away so that you can pull them out and study them whenever you are facing stress or strong anxiety. When you do pull your scripts out, compare your present thinking to your hard-luck and empowered scripts. This will keep you honest and enable you to adjust your thinking so you’re operating from an empowered script. These periodic reminders will eventually rewrite your scripts completely, enabling you to operate from an empowered script at all times. Step 4: Spot and stop negative self-talk. A big step in managing stress and anxiety involves stopping negative self-talk in its tracks. The more you ruminate on negative thoughts, the more power you give them. Most of our negative thoughts are just that—thoughts, not facts. When you find yourself believing the negative and pessimistic things your inner voice says, it’s time to stop and write them down. Literally stop what you’re doing, and write down what you’re thinking. Once you’ve taken a moment to slow down the negative momentum of your thoughts, you will be more rational and clear headed in evaluating their veracity. You can bet that your statements aren’t true any time you use words, such as “never,” “worst,” or “ever.” If your statements still look like facts once they’re on paper, take them to a friend or colleague you trust and see if he or she agrees with you. Then the truth will surely come out. When it feels like something always or never happens, this is just your brain’s natural threat tendency inflating the perceived frequency or severity of an event. Identifying and labeling your thoughts as thoughts by separating them from the facts will help you escape the cycle of negativity and anxiety, and move toward a positive new outlook. Step 5: Count your blessings. Taking time to contemplate what you’re grateful for isn’t merely the “right” thing to do; it also lessens anxiety because it reduces the stress hormone cortisol by 23 percent. Research conducted at the University of California-Davis, found that people who worked daily to cultivate an attitude of gratitude experienced improved mood, energy and substantially less anxiety due to lower cortisol levels. Overwhelming anxiety and empowerment are mutually exclusive. Any time you are overcome with enough stress or anxiety to limit your performance, just follow the five steps above to empower yourself and regain control.